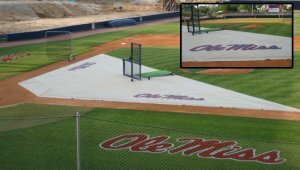 Batting Practice Zone Infield Turf Protector made with Premium Vipol® Matrix Mesh to guard against divots during batting practice! The BP Infield Turf Protector made with Premium Vipol® Matrix Mesh to guard against divots during batting practice! CHROMA-BOND Printing available. Call for details or email us your graphics for a custom quote.